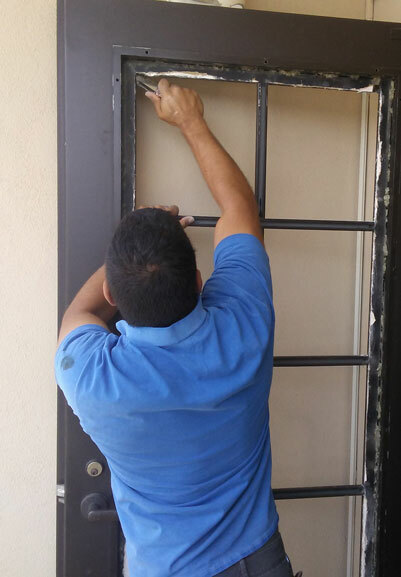 A National Glass technician installs a piece of replacement dual pane glass in a french door. At National Glass we offer a full spectrum of glass replacement services for the Santa Clarita Valley. If you have a broken single pane or dual pane window or patio door you can get a free in field estimate from one of our trained technicians. For single pane windows the broken glass may even be able to be fixed the same day in the field! Patterned glass and textured glass for privacy or design. Low-E energy efficient glass for reduced energy bills. Tinted glass and colored glass in a variety of colors for reduced heat transfer and design. Call us today at 661-259-6444 to discuss your needs and schedule an appointment.